My family and I have used the first three methods during our vacation trips to crayfish lakes in Arizona. 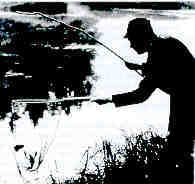 At first we simply took an old fishing rod, attached a string to it and stuck some bait to it. A fish hook or a safety pin will do just fine to keep the bait from falling off or being pulled into a crayfish hide-out. Even after I aquired some Swedish crayfish traps, our kids and I continued catching crayfish with the simple string and bait method. And we caught hundreds of crayfish that way having a lot of fun while doing it. Here is how we do it. First wait until the sun is down and it is getting dark. Equipped with a strong flashlight, preferably attached to my head, like a miner, and with a bucket and a rod plus line and bait I walk down to the shore of the lake. If you are lucky you will see crayfish sitting on the rocks or crawling between their hideouts among some rocks. I slowly lower the string and bait in front of a crayfish. If not scared away, he/she will attack the bait and start eating it. Then slowly I move the crayfish and bait, still in the water, as close to the shore as possible before lifting it up and immediately into the bucket. Yes, you'll lose a few, but most of them will be greedy enough to hang on to the bait. However, as soon as I realized that the Arizona lakes had enough crayfish in them to keep me happy for years, I started investing in traps. The first ones were of the open kind. Some of those open traps I bought, most of them I made myself. Even with my limited engineering abilities, I was able to make an open trap using a fish landing net threaded onto a wire hoop of a couple of feet's diameter. Three strings were attached around the hoop tied together a couple of feet above the netted hoop, maybe with a cork at that junction. Attached to the middle of the hoop net some tasty crayfish bait. And then a single string from the string junction and the cork up to the surface of the water. This open trap works quite well especially if you can visibly inspect it and then pull it up every time you have some crayfish in it. With several traps of this construction in the water, you'll soon have lots of crayfish in your cooler. The third, and most productive method, is the closed trap. In this group there are numerous varieties. In olden days, a common design consisted of a beehive-like contraption with an entrance at the top. In my youth I often saw that kind of trap in Sweden. With a collar of metal around the top opening, the crayfish would have difficulty getting out again. However, soon that model disappeared in favor of the tubular trap made of coiled wire on which netting has been stretched. This trap has an funnel opening at each end through which the crayfish can enter. This trap is also collapsible which is convenient when transporting large amounts of traps. My experience with this trap has been very positive as it is quite productive and has lasted for years in spite of frequent usage. Its only drawback, as I see it, is that crayfish can, and will, escape after they either have eaten their fill or finished what bait is in the trap. For that reason I believe this trap should be emptied every three of four hours to avoid escapees. A variant on this tubular trap is the TRAPPER Crayfish Trap I have recently developed based on ideas I got from other trap makers. This trap is made from vinyl covered hardware cloth and is of about the same dimensions as the collapsible Swedish trap. This trap, though, has an interesting feature that prevents crayfish from escaping. The funnel entrance at each end of the trap has a rigid ring leading to the inside of the trap where the bait is tempting the hungry critters. Don't keep your crayfish catch in a bucket of water. Crayfish need oxygen to survive and stagnant water soon has none left. Keep crayfish moist and cool and they will stay alive for days. Thanks to this ring, a wire collar of metal fingers can be attached to keep the crayfish from escaping. The advantage of this escape stopper is that, instead of having to empty the trap every so often, you can leave it in the lake all night. A traditional trap with no escape stopper is estimated to lose up to 70% of its crayfish over night. This new variant of crayfish trap puts a stop to that. A disadvantage of the rigid trap is, of course, that it cannot be collapsed. It will therefore take more space during transport. Oh, well. You win a few and lose a few. 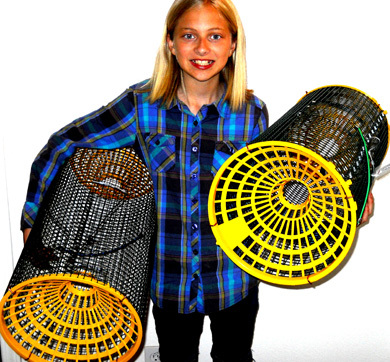 Another variety of traps is the relatively new plastic trap with yellow entry funnels. 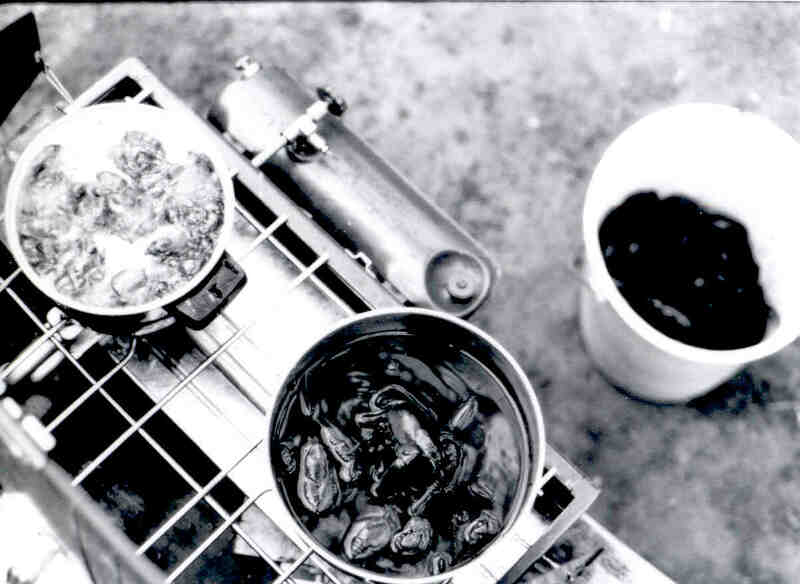 This trap is fast gaining popularity in crayfish countries all over the world. 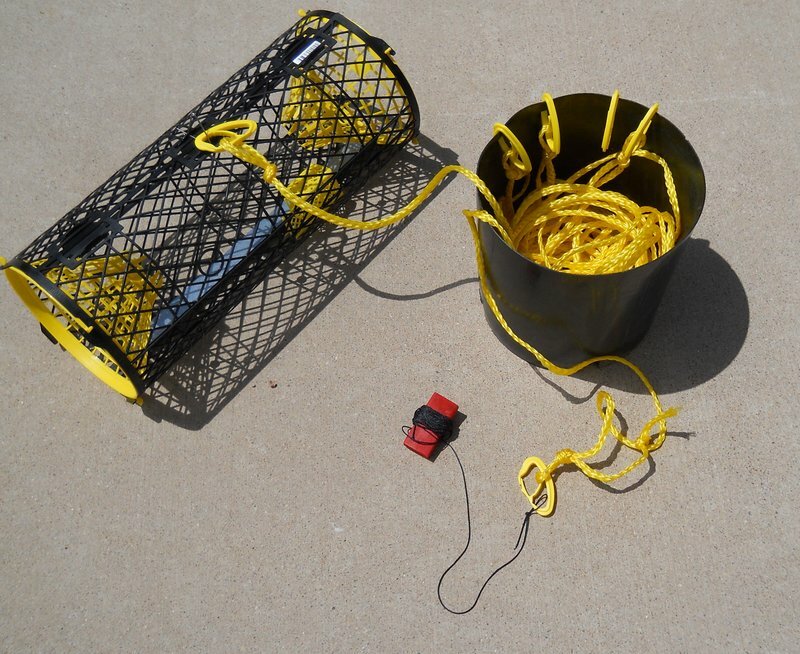 It is called the Trappy and is a collapsible tubular trap that is easy to empty and bait. As it is collapsible, it takes less space than rigid traps. Homemade traps come in all sorts of shapes. Many are square shaped which I do not recommend as they tend to snag easily among rocks on the bottom. (I know, I built one and lost it almost immediately.) A trap with a flat bottom may also has a tendency to land on top of rocks on the bottom in such a way that the entrances are hard to find for the hungry crayfish. The old round beehive type trap also has that problem on a rocky bottom. When I first started catching crayfish, I did not have a boat. I simply threw out the traps from the shore, hoping that the water depth would not be greater than the length of the trap float string. But pulling in a trap from the shore is asking for trouble. If the bottom is rocky, you are bound to run into snagging problems. I did. So whatever you do, try to drop the traps from a boat or a pier. Once in a while I see the seine mentioned for catching crayfish. 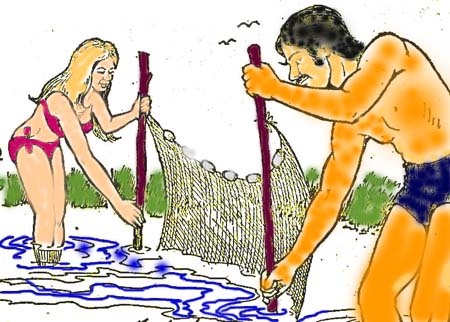 Two persons holding a net between them walk along the shore or creek hopefully catching crayfish in the process. As I have never tried this method or have never seen it used, I have doubts about its usefulness. I cannot recommend it. 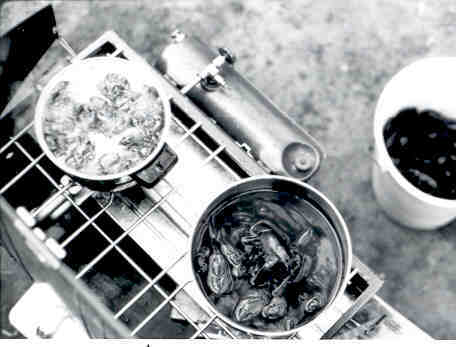 The best time for catching crayfish is when the trap is baited. Now, that may sound a little facetious, but it is basically correct. Of course, crayfish are nocturnal and prefer to be active during the night. However, if a crayfish 'smells' some delicious bait in the neighborhood in the daytime, he/she will make a run for it. As I have in the past caught more crayfish at night, and as the traditions about catching crayfish favor the dark hours when you are more likely to catch the big ones, that's the time I recommend. But don't neglect trying your traps during the day also. You may catch just as many as at night. And if you have nothing else to do or if fish don't bite, don't pass up the chance for daytime crayfish catching. Finally a trap experience from Wheatfields Lake on the Navajo reservation. 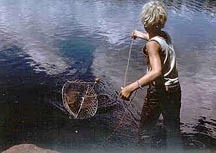 One afternoon my son Peter and I sat fishing for trout from the shore. Suddenly I noticed a large crayfish slowly crawling up toward us. Soon I saw another one. And then even more here and there. To my delight I realized that there were crayfish in the lake, and large ones too. But what was I to do? I had nothing to catch crayfish with. I am not an engineer, but surely deep down in my genes flow some of my father's DNA. He was an engineer and also an avid crayfish catcher back home. 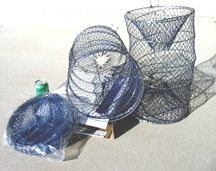 Looking around for what I might find to catch some crayfish, I cast a long look on my fish basket made out of collapsible metal mesh. The top end had a spring loaded lid to keep the catch in. But it could be propped open, couldn't it? Of course it could, and with a just long enough stick I could make the lid stay open. And then, bait. We happened to have a few newly caught trout, so I quickly severed a tail and a head and stuck it under the spring in the lid. Another long stick held the rest of the fish basket open all the way to the bottom. A long string already was attached to the handle of the fish basket. Voila! There I had my first crayfish trap. I threw out this unlikely contraption into the water as far as the string would reach. And then Peter and I just sat there and waited while we still tended to our trout fishing poles. While preparing this makeshift crayfish trap I noticed that some of the Indians who were also fishing nearby watched us with gleeful interest. They apparently realized I was trying to catch some crayfish. I could read in their faces that they could see no sense in our activities. After a while, maybe an hour or two, we decided to pull up our trap for the first time. And by golly, we had caught plenty of crayfish in it. We were delighted, especially I who had made the trap and who had the Swedish crayfishing genes in me. But all the Indians around us were laughing and pointing at those silly whities who were dumb enough to try to catch crayfish. To Indians crayfish is something you just don't eat. Well, dumb or not, when evening arrived, I had enough crayfish for a big meal of crayfish. And I was privileged to eat them all myself as neither my wife, who is allergic to crustaceans, nor our children would eat any.